Ellicott Development is always working on something. At any given point, we have a multitude of current projects. Some of our current projects include the construction of mixed use buildings at 1350 Eggert Road, 1 Delaware Road, 905 Elmwood Avenue, 1088 Niagara Street, and 960 Busti. 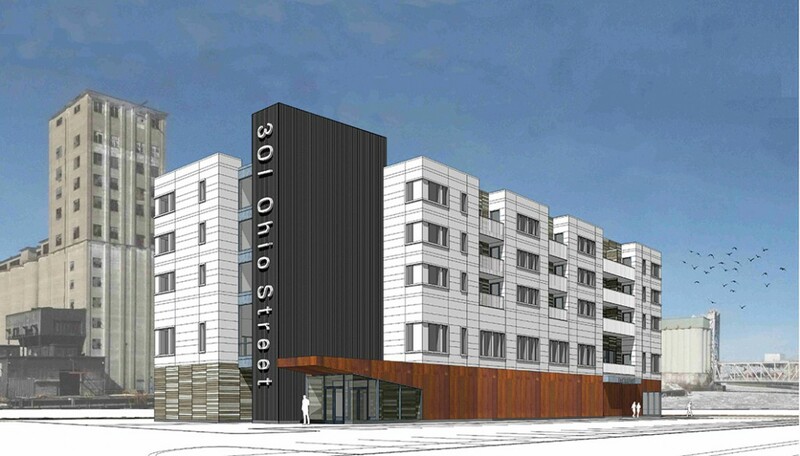 Another mixed use property, 301 Ohio Street, is one of our most popular current projects. This property will house apartments (21 in one and two bedroom configurations) and commercial space (10,000 square feet). 301 Ohio will also hold two restaurants on the first floor. This building will be an exciting neighbor for the popular RiverWorks entertainment destination. Fans of RiverWorks will be glad to know that Ellicott Development wants to increase the entertainment available by the water by offering a recreational area including outdoor volleyball courts as well as boat slips adjacent to the north side of the property. Our vision is to use 301 Ohio Street as a way to breathe new life into this primarily industrial part of the city. Across the street at 300 Ohio Street, Ellicott Development is working on an office building to accommodate for 120,000 square feet of office space. Keeping with our waterfront interest, EDC also recently purchased 13-acres of property on Ganson Street (which you can read about in our previous blog posts). It is undecided what will be done with this property for now, however it will undoubtedly draw people to the area and continue to increase and improve development of the location.